If nostalgia were a disease, I would be immune to it. I have yet to remember any time in which the past seemed like a place I wanted to go back to. I live by the philosophy that if we spend our lives yearning for the times gone we won’t find the energy to make our present the best possible. Days like these I look back fondly on the times I shared with the people who are now gone, on the days of my childhood, and the little things that makes it worth remembering. It wasn’t the material things, I don’t come from a wealthy family, but my parents gave me all they could, I had family, love, and lots of books. They filled my childhood with memories. The sound of the creaky wooden floor in my aunt’s victorian house, which scared the living lights out of my 5 year old self (there were monsters living in the crawl space!). The smell of burning mesquite in my grandma’s backyard bonfire, around which she told her horror stories. Stories that would send her grandchildren to sleep hugging under the covers of our shared beds, so the ghosts and ghouls of her stories wouldn’t find us. The school Christmas recitals, and my mom’s enthusiastic praise for what I, and everyone, knew to be the worst singers in the world. Nobody remembers the material things, the plastic toys are long gone, at the bottom of a trash heap somewhere, nobody misses them. What we remember is the moments, the people, the smells and tastes coming of our mothers’ and grandmothers’ kitchens. We remember the laughter, the food, the love. I am ever so glad that my daughter doesn’t seem to have a materialistic bone in her body. As of today she hasn’t asked for anything. No list, no demands, no pressure. Whatever we give her (probably more books) she will be elated. It takes so little to make a child happy: family, love, and lots of books. My daughter’s school is quite multi-cultural, I can count several multi-cultural children in her class, but the school itself follows, for the most part, the American curriculum and calendar. So a day before Thanksgiving I find myself with the assignment of bringing an apple pie for her class Thanksgiving meal. Oh well, I guess I will have to make more apple pies. And then my poor, poor family will have to eat them. I hope you appreciate the sacrifices we make for you. So, my dear friends, if you celebrate Christmas, may you have a happy one, with your loved ones at your side. And may you create new, meaningful, long-lasting memories. I know we will. Ginger-Spiced Apple Pie Recipe: Grab an American tradition and throw in one of our favorite spices and get yourself a new favorite dessert. Ground the almond in the food processor until the pieces have half the size of a grain of rice. Add flour, sugar and butter. Pulse until it resemble peas. Add the cold water, slowly, until the dough piles up in one big chunk. Remove from the bowl. Form a ball, wrap in plastic film and leave it to rest in the fridge. 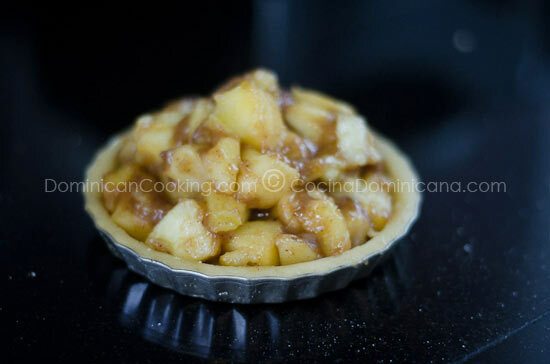 Core, peel and cut the apples into either slices or cubes (your preference). Mix with butter, cloves, ginger, sugar and cinnamon. 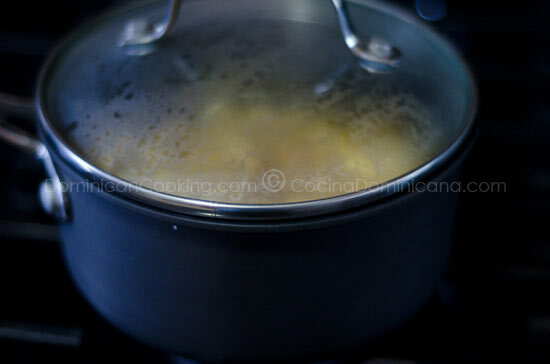 Place in a pot, cover and cook over very low heat until the apples are cooked through, but firm. The time will depend on the variety of apple you use (see notes). Remove apples from the heat and cool to room temperature. Mix yolk, milk, sugar and butter. Mix well. Roll out two circles, dusting the work surface with flour to prevent it from sticking. Wrap one circle on the rolling pin to lift off the surface. 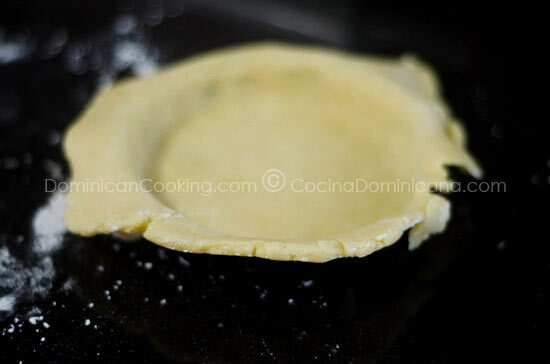 Place one circle on a pie pan, press lightly to shape it. Cut out some holes into the second circle, you can use cookie cutters for this. Top the pie with the second circle of dough and scrimp the edges. Pre-heat oven to 350 ºF [200 ºC]. Bake the pie for 15-20 minutes, or until crust turns golden brown. Remove from the oven and let it cool down until it feels warm to the touch. If you know your way around a classic apple pie you'll notice a few changes to the traditional recipe, mainly the pre-cooked apples. There is a reason for that: not all apples are created equal. Not all apple varieties are good for this dish, but I don't always have a choice, I have to get what I find in our local supermarket. Pre-cooking the apples solves this problem. This recipe borrows a couple of touches from Elise Bauer's Old Fashioned Apple Pie (mainly the almond crust). You can make either a big pie (9" pan), or several smal ones, with or without cover. I tried several combinations. For the filling, I ended up throwing fresh chopped ginger into the food processor with the butter and sugar, and a little bit of milk. It was a great change-up from powder. I didn’t have cloves but I did use cardamom. Excellent recipe! oh yes! 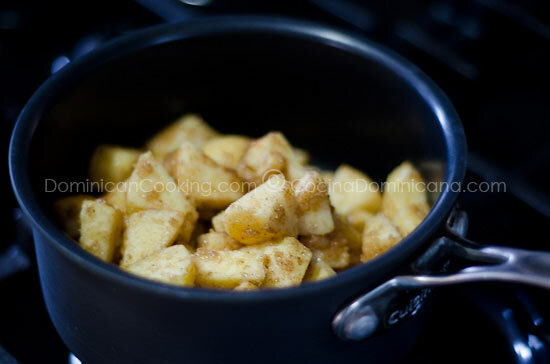 jengibre is such a treasured flavor in Dominican cooking. I bet their warmth made the apple pie so much better. Thanks for sharing your recipe. The pictures and post were beautiful. Wow, I love your writing in this post. The memories we make with the people we love. Excellent essay. And I am sure the pie was very very good.